True friendships are rare treasures that withstand the test of time and distance. This past weekend, eight of my friends met for a girls’ weekend in New York. The arrivals began as early as Thursday afternoon and the departures started at 6am Sunday morning. Over several great meals, we caught up on now and reminisced on then. Mostly, there was a lot of laughing, a lot of drinking, a lot of eating and a little singing. Only two of us live in New York. The rest traveled from Los Angeles, Vermont, Boston. and Connecticut. The restaurants ranged from uber chic to dirty diner. From downtown to the upper west side. And while not the trendiest, I was most happy to share with my friends my favorite neighborhood Italian restaurant, Bello Giardino. The place isn’t much to look at from the street – a small store front just east of Columbus Avenue on 71st Street. The Tuscan themed dining room is just down a few stairs. It’s clean and well-lit and unlike so many restaurants, the tables aren’t crammed together. The owner, Nick, is always there to greet his guests at the door. None of that separates it from the 1,000 or so small Italian places in New York. But, when you pass through the restaurant, by the kitchen and the restrooms, there is a beautiful garden underneath a canopy of grapevines. It was about 1,000 degrees and muggy Saturday night, but the nine if us sat centerstage at a table in the secret back garden. 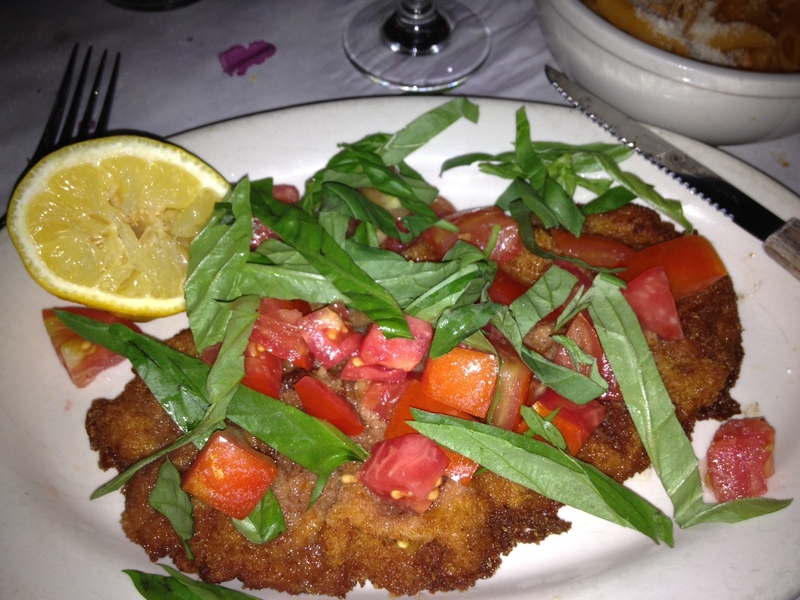 I always order the same thing….Veal Milanese. It comes with a side of Bow Tie pasta and instead of the traditional marinara sauce, I ask for the vodka sauce – best in town. I’ve tried to mimic this at home…here’s what I do…. 5. Once the Olive Oil is shimmering in your skillet, add the breaded veal cutlets and cook about 4 minutes on each side. This entry was posted in Comfort Food, Dinner, Italian Cooking, Veal and tagged Bello Giardino NYC, best friends, Chicken, chicken milanese, cooking, dinner, friends, italian, italian cooking, new york, recipe, spaghetti & meatballs, stand by me, stephen king, veal milanese by AnniesDishList. Bookmark the permalink.